It’s early morning, the weather is stormy when we leave the camp and the landscape is dressed in pastel colors, nature is waking up! 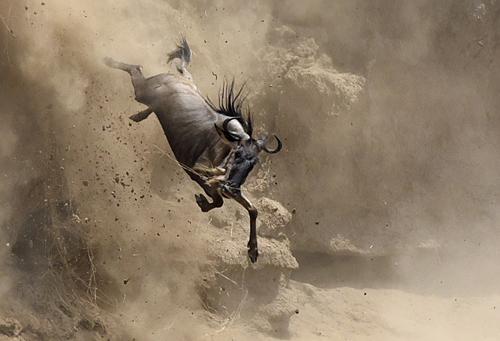 The wildebeests are everywhere; we decide to stop the car and wait. 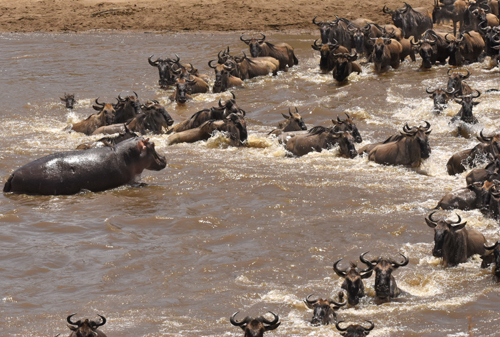 After a while, a herd seems to be on the move to cross the river. We are in the North of Tanzania, in the famous Serengeti Plain, at the border of Kenya. 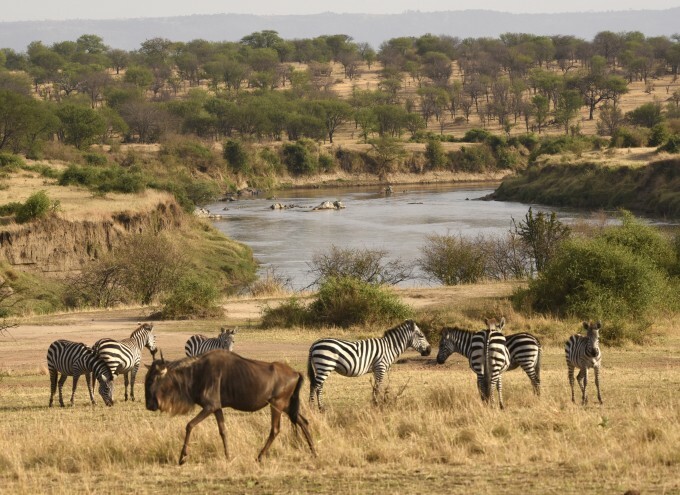 This side of Tanzania has fewer vehicles and the 2 banks of the Mara River are connected by a bridge, which is a great advantage on other places. We sat in the car near the river and have a panoramic view on the huge golden plain. 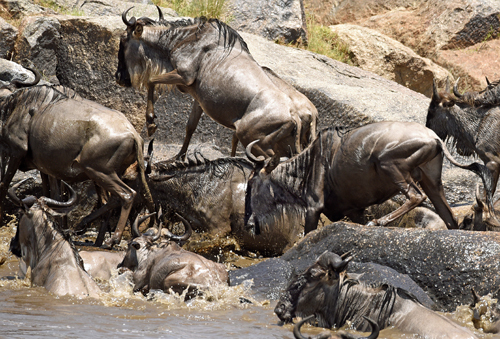 The wildebeests are slowly gathering and we must be patient, first they sniff the river bank and jump into the water before moving in a single file, some others go away without any reason and climb up the slope, appearing like cartoons on the bluesky; it’s a fantastic vision that we imagine just in books! I look far away, it’s a curious atmosphere and a strange feeling invades me when I see the gnus lined up like miniature lead soldiers, they are everywhere; I am not used to see this scenery, the lines move slowly to join those already arrived. I don’t know how long it will last; I don’t see any end, and I imagine that could take one, two hours, more? Nobody knows until suddenly they start gathering in a thick herd and begin to come close to the river. This time, they have made up their mind; they look for the best place to cross. That’s the moment and we began to be excited, anticipating the next action as suddenly, they change their mind and with no apparent reason again, they turn back and they all change of direction! Why? Mystery… Nobody could tell me! The first crossing I saw, they were 5000 heads. One alone went to sniff the water and went back to the others waiting; it appears that after this try, some attend a kind of meeting with an elite group. 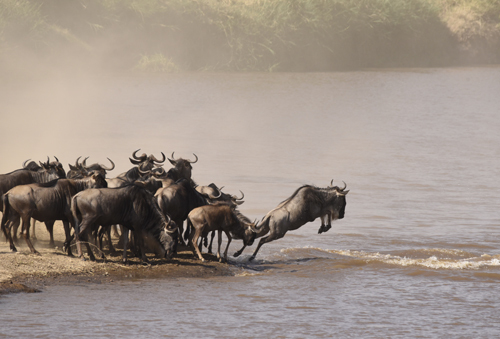 The order to cross given, the all herd run tightened to jump into the water, putting all their strength to cross the Mara River. The crossing is never easy, the families are often separated and I could observe touching moments. I remember a young one, which had landed on the other side; he was alone looking desperately at the river to find his family. He was at the top of a slope, moving like in a cage, his fear was contagious but as soon as he saw her mother, he began to skip with joy following her. What a beautiful memory! Unfortunately they don’t all have this luck and I will never forget, this mother with her baby, she was lost walking along the bank blocked between the river and a slope. Apparently there was no reason to be worried but the reality was different. 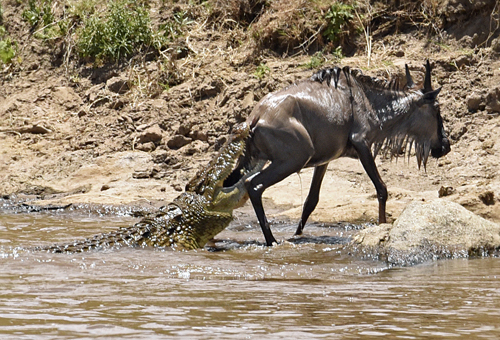 They both had to climb the slope to find back the other wildebeests; after several tries she succeeded but not the calf, which had too small legs and felt back into the water directly in the mouth of a crocodile. He had no chance to survive and was strangled under the look of her mother staring at the tragic situation. She was still looking when we left, it was dreadful and I felt uncomfortable. My hope began to decrease seriously when we were informed that another crossing seemed to be on the way not far from us. The reaction in theses cases is to be prepared for a running and nearly flying start and drive My 2 arms strongly “fixed” at the Land Rover to avoid to be ejected, I thought “I was ready to join the “Paris Dakar”…This time the crossing was beginning in front of us from the other bank and I was at the best place, the show was unbelievable and very impressive. The river was protected by high steep cliffs of about 6m or more. Around 15000 animals were going down in long black lines drawing a map looking a bit like the Okavango Delta. 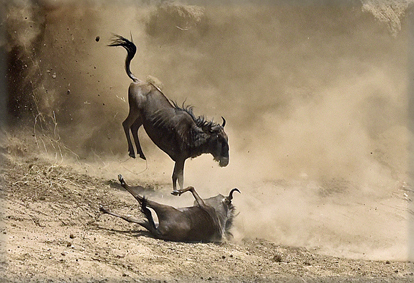 It was amazing, the scenery looked like a true suicide of the wildebeests. While many of them could find some trails cut in the cliff allowing an easier way, other groups remaining at the top of the cliff were looking down the precipice, evaluating the high and the hardness of the ground for their future “reception”…They stared carefully at the fall of the most intrepid before deciding to go. 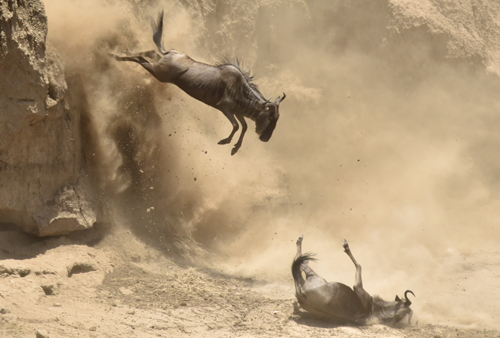 The fall is really frightening; they plunge with the head first into the void trying to slow the speed by bumping on some roughness, which often lead them to twist in the air before a brutal landing. Fortunately many of them are safe, just a bit KO coming back to reality one or two minutes later. But some others have a broken leg, they stayed in the water shouting with distress, conscious they are condemned and it is dreadful to see them helplessly! The difficulties of crossing are not only due to the cliffs, I have observed crossings which at first sight could not let me imagine the coming tragedies which were going to take place. 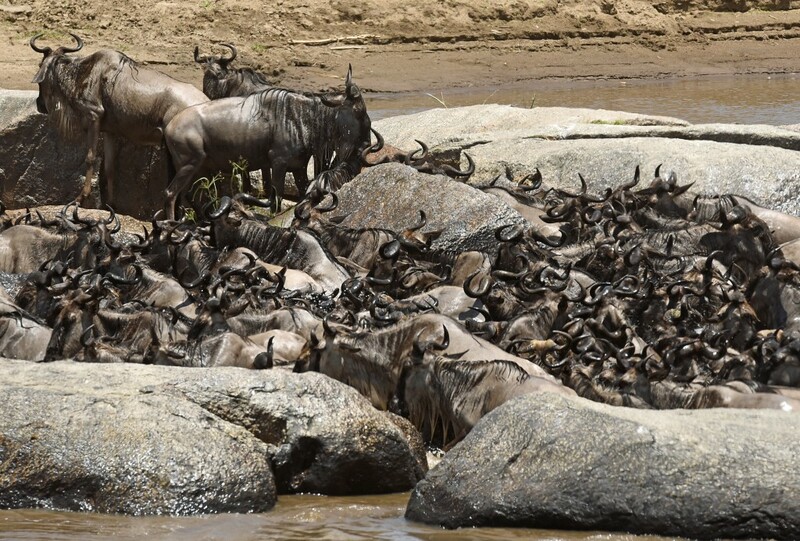 When there are no cliffs, the Mara River is often full of big rocks in its middle. It seems then that there is a leader (or several) to which the whole herd must obey. When the signal of going is given, they all rush following the head of the herd, and that can be a disaster when the decision left many of them without “Return tickets”. That was the case, this time, the first estimation was completely wrong, the blocks of big rocks were making a funnel in which they were entering unconscious of the appalling trap. 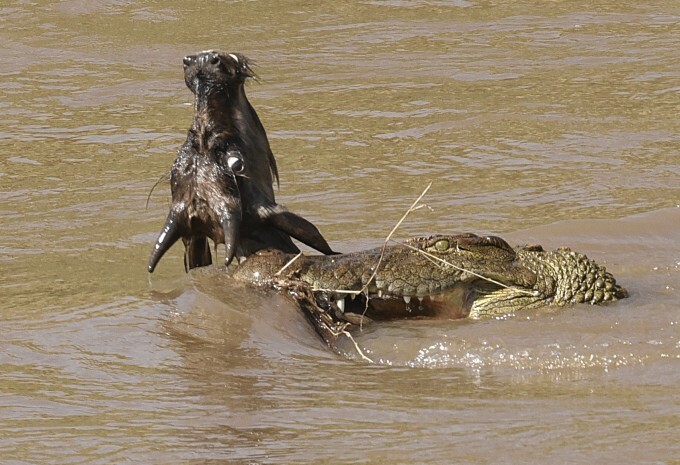 The animals go among the rocks in quantity while only few can go out; they have to fight to survive, they fall, they slide, they step on themselves or remain stuck in the stones. It’s truly an apocalyptic vision that I will never forget. However, in spite of this apparent unconsciousness, there is like a reflex of common sense as suddenly and in an unexpected manner, another file in parallel is taking place just near but out of the trap. A thinking head has understood the problem and has changed the way. The group luckier will cross safely at 50m from the other prisoners. 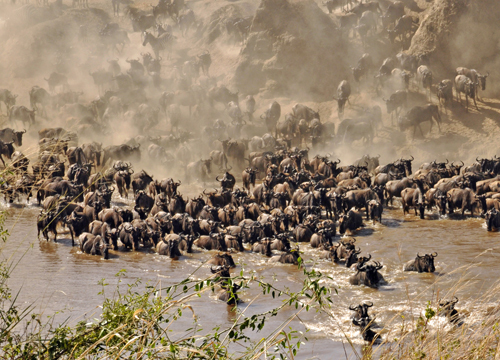 It happens that some wildebeests, once they arrived on the other side, turn back, facing the herd crossing. They have realized that their family is not here and they want to be sure that they are ok. It’s touching after they took so many risks. 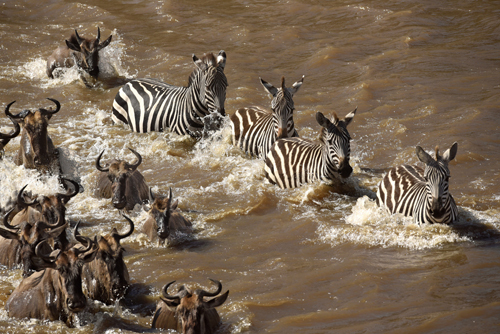 Referring to zebras, they are not working the same …They cohabit well with the wildebeests without any problems. 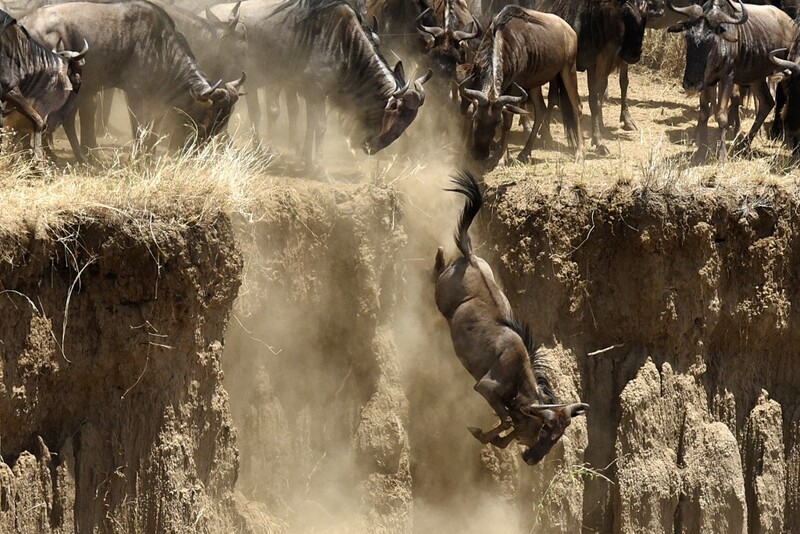 They eat the same grass but not the same part, while zebras eat the taller grass, the wildebeests prefer the shorter one…When there is no more grass, both of them need to migrate. 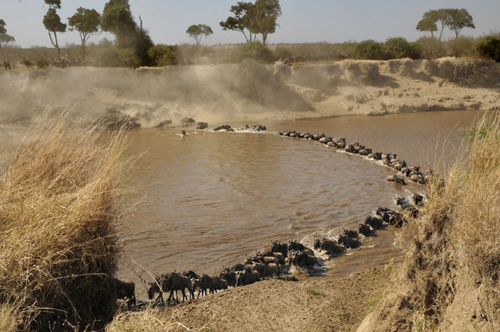 The crossing of rivers is dangerous for them too but they use the wildebeests to test the risks of a passage. 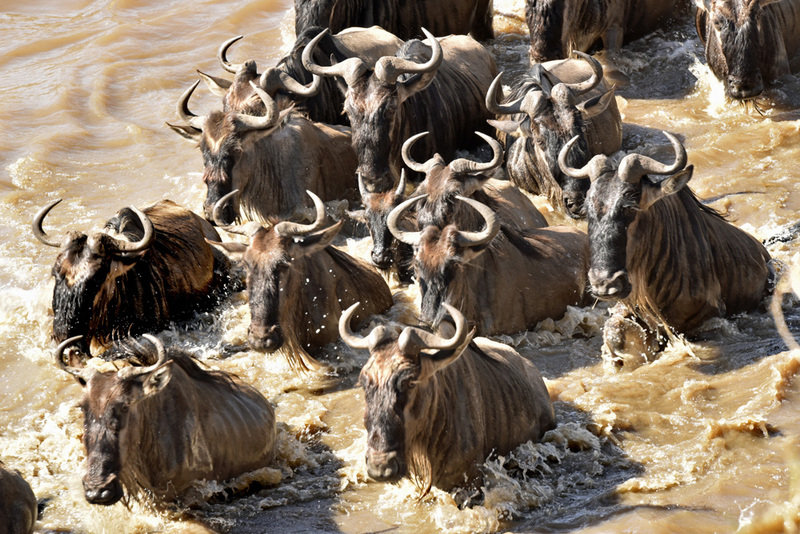 They first let the wildebeests go and if everything looks safe, they join them to reach the other river bank. 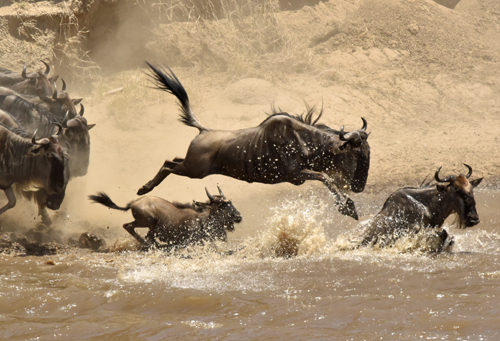 If not, they abandon the wildebeests to test another possible crossing. Clever, they have understood they have the choice to decide what to do according to the security of the place. They are quite aware there are several passages per day and they take their time studying the difficulties encountered by the gnus. One morning, there was a crossing that appeared to me quiet and for once I was cool! 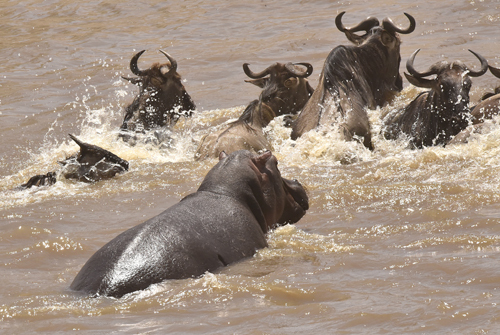 Everything was going well until a Hippo family jumps out of the water, they were very angry after the wildebeests, which overrun their territory. They could not support such intrusion and began to run after forcing them to rectify their way. 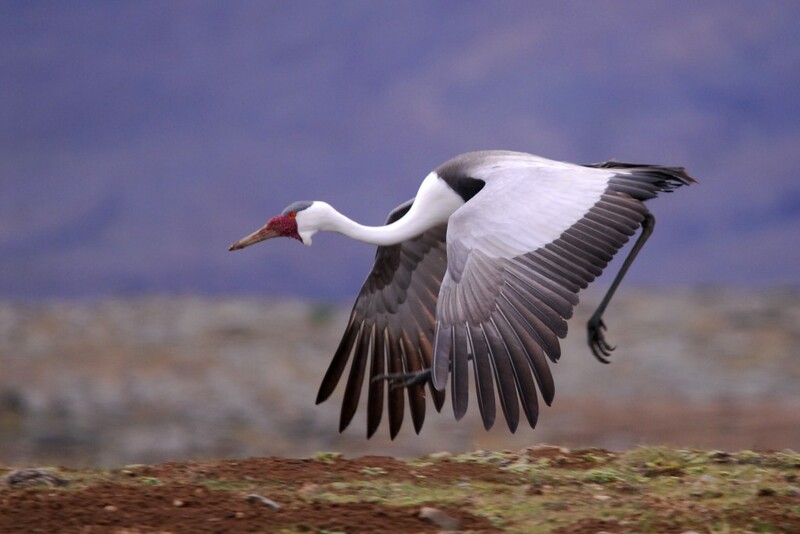 Then, as soon as they moved just 4 meters further, they stopped fighting them, remaining quite vigilant! The world of animals is a very weird world and sometimes subtle which our common sense cannot always understand but which obviously has a logic explanation, we just have to find it!! !